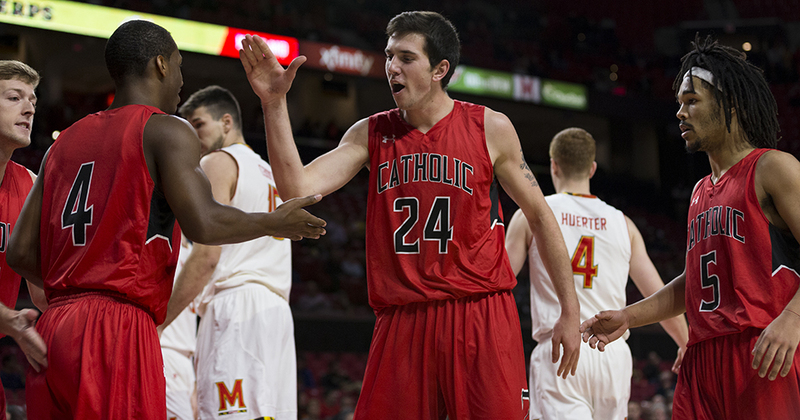 The CUA Men’s Basketball team continued a dominant string of games with a 90-64 thrashing of the Goucher Gophers. The win advances the team’s record to 9-7 overall and 3-2 in conference. The Wednesday, January 18th home win pushes the team to a three-way tie with Moravian and Scranton for the third spot in the Landmark Conference. The team went on a hot streak over winter break, going 5-1 over the three-week period including a victory in the Catholic Holiday Inn College Park Classic in the DuFour Center. The team has been led by senior forward Jay Howard, who is averaging 24/7/2 and shooting 55% from the field. Junior winger Jimmy Golaszewski has been a breakout star for the team, averaging 15/5/2 while shooting 54% from the field and 53% from deep on 6 attempts per game. The win over the Gophers was a team effort as 10 different Cardinals made appearances on the score sheet. The squad also shot 48% from the field and only turned the ball over 8 times. Howard led the way once again with a 22 point effort, his 6th straight game with 20+ points. The 6’4” power forward shot 10-15 from the field and tacked on 7 boards, 2 assists, and a steal on the stat sheet. Sophomore Riley Hayes dominated the glass in his second straight effort with at least 14 rebounds and added 12 points on the night for the center’s 3rd double-double of the year. The Gophers found the scoreboard first on an opening 3-pointer, but the Cardinals took control of the game immediately after, going on a 14-2 run. The team went into the half with a healthy 43-29 lead. Goucher started the second half strong when it cut the CUA lead down to only 6 points, but the Cardinals could not be stopped as they expanded the deficit to 31 points with only 6 minutes left in the game. Hayes and Howard contributed most of their statistics by dominating Goucher in the paint. The Cards outscored the Gophers 38-10 on points in the paint. CUA also outrebounded their opponents 49-36. The Birds also dominated the defensive battle, holding their opponents to shooting 34% from the field and converted 20 points off 13 Goucher turnovers. Golaszewski was once again a standout with 14 points and sophomore Ross Gerber had 12 points to round out the teams 4 double-digit scorers. Junior point guard Andre Mitchell was facilitating the teams scoring with 8 assists with 0 turnovers in almost 30 minutes of play. The team looks to continue this streak as it takes on the Royals of Scranton in a key Landmark Conference matchup this Saturday at the DuFour Center. The Royals are only one game ahead of the Cardinals in the Landmark table. This is also the first time the two sides will meet since Scranton eliminated the Cards 75-68 in last season’s Landmark Conference playoffs. The game is set to tip off at 2 PM and will precede the women’s matchup against Scranton following the game’s conclusion.